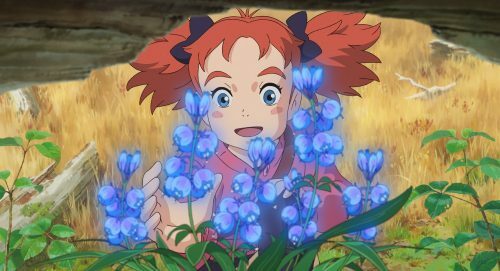 Altitude Film Distribution is delighted to announce the UK release of Mary and the Witch’s Flower, releasing in UK and Irish cinemas from 4th May 2018. A magical anime fantasy adaptation of the beloved British children’s classic ‘The Little Broomstick’, the film arrives from the makers of Studio Ghibli classics When Marnie Was There and Arrietty. A special one-night exclusive fan preview of the Japanese language subtitled version will introduce audiences nationwide to the magic on Tuesday 10th April 2018. Directed by Hiromasa Yonebayashi (Arrietty, When Marnie Was There), Mary and The Witch’s Flower is the first feature film produced by Studio Ponoc, founded by Studio Ghibli veterans Yonebayashi and Yoshiaki Nishimura, and the new home of the animation team that crafted Studio Ghibli’s acclaimed classics. Studio Ponoc lovingly continues to draw inspiration from European children’s literature and uniquely blends it with the long-standing themes of nature, environmentalism and feminism.